Sorry for your loss. He was a great man. It's not much consolation, but I hope Dan's family knows how special and important he was to a lot of people. He also inspected my guitar about 56 years ago. Such a sad time for the Duffy family. But we, the Gretsch community, have also suffered a great loss and one of the last connections to the Golden Era that we celebrate every day with our vintage a gretsch guitars. God speed Dan. It was great to have him here. He takes his place with the other greats like Duke Kramer, Jimmie Webster. It is good to see this inspection cards that he signed -- so in a way he is still is here. My condolences to you and your family, Joe. Sorry to learn this. My condolences. Sorry to hear about Dan. My condolences to his family. I enjoyed his books and his messages here. So sorry to hear of your dad's passing. My condolences to all of Dan's family and loved ones. Condolences to Dan's family and friends. He was a link to history and part of it. Very sorry to hear that. My condolences to you and family. That is very sad to hear. My prayers are with you and your family. I wish I could've paid my respects as I live only 10 - 15 minutes away and am very sorry for your loss Joe. You and your family will be in my prayers. This is very sad news -- for MANY people. My condolences to you and your family. Sad news, indeed....sorry for your loss. Tried reach you thru contact, but the email isn't working. Was corresponding with Matt Umanov, in NYC, who worked at Gretsch in the 1960s -- he knew Dan Duffy, had not heard the new, and wanted to communicate some info you, Dan's sons. If you would like he can be reached at info@umanovguitars.com. I'm just now learning about this. I'm so sorry to hear about Dan's passing. My deepest heartfelt condolences for you guys and the family, and friends. We sure will miss Dan. I always enjoyed seeing him post here. I'll read his book today. Very sad to hear , My Condolence to Family , Indeed He will be Missed here . I just saw this also... my condolences to you and the family, sad day indeed. So sorry for your loss, actually all our loss. I so enjoyed reading his book. He will always be remembered. Brian... as you go through the difficult process of sorting through Dan's possessions please keep us in mind when you find things that might be of some historical significance to Gretsch guitars and/or Dan's time with the company. 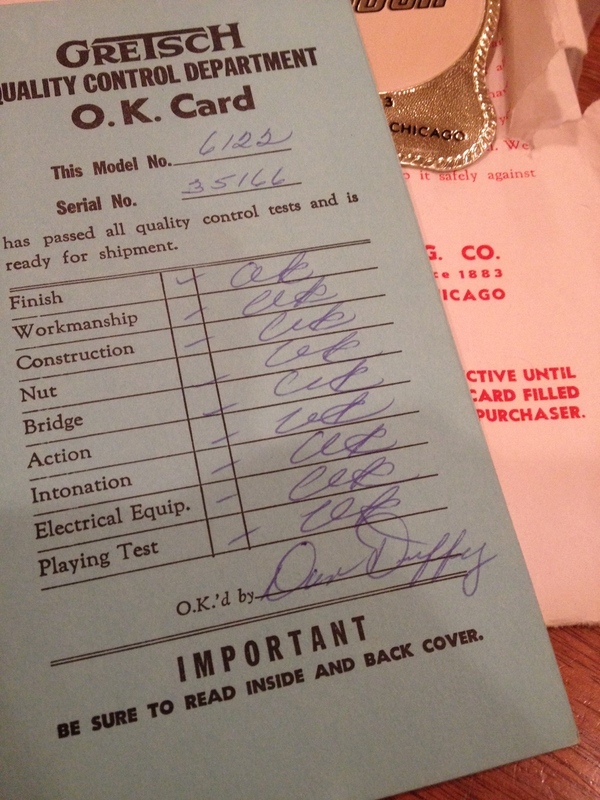 There is precious little artifact evidence left after the Arkansas Gretsch factory suffered it fire(s) in the 70s. I've been seeking Brooklyn factory information for years, and was fortunate enough to have gotten some first-hand stories and quotes from Dan for my first Gretsch book. If you have any questions about the things you find and think might be relevant please feel free to post on the GDP, or even contact me directly at Gretsch_Ed at yahoo dot com.